The Recycle Bin icon on the desktop in Windows can be easily been deleted or removed by user. If you cannot find the Recycle Bin on the desktop, or the Recycle Bin icon is missing or lost, or you have accidentally delete the Recycle Bin shortcut, here’s the simple recovery method to get back or unhide the Recycle Bin icon to the desktop. Open Personalization by clicking on the Start button, then clicking Control Panel, follow by Appearance and Personalization, and finally Personalization. 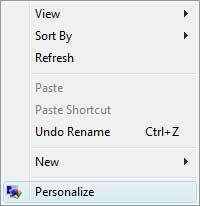 For shortcut, simply right click on Desktop and select Personalize. In the left pane of Personalization window, under the Tasks section (if applicable), click on Change desktop icons link. In the Desktop Icons Settings window, check and tick the check box next to Recycle Bin to show the icon on the desktop. Please ensure that only the Recycle Bin icon is hidden, and you have not chose to turn off displaying of all desktop icons. You can check the Show Desktop Icons setting whether it has been disabled by right clicking on Desktop, and select View from the right click context menu. The trick works in most Windows versions, including Windows Vista, Windows 7, Windows 8, Windows 8.1, Windows 10 or later.